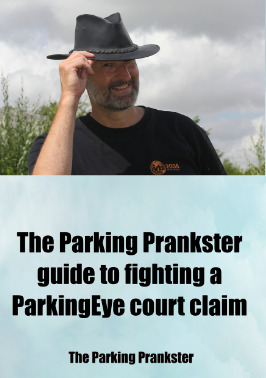 The Parking Prankster has been a bit quiet for the last few weeks - this was because he was putting the finishing touches to two guides to help motorists fight ParkingEye court cases. 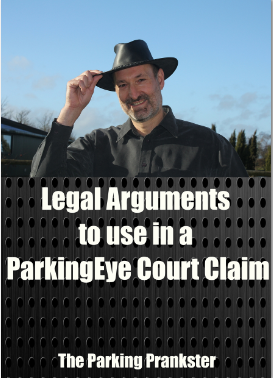 With ParkingEye regularly filing over 1,000 court cases a week - and approaching 2,000 in one week, The Prankster does not have enough time to personally help everybody, and so wrote these two guides. The first guide explains the processes that go on while fighting a court case, explains the forms you get and explains why both ParkingEye and the courts would much rather you negotiate than go to a hearing. It gives tips and ideas which have in the past helped motorists to settle for as low as £20. If you prefer to go to a hearing, the guide tells you what to expect, how to research your case and how to gather the evidence you need.It also describes some of the success stories that have occurred over the last year. The second guide explains the legal arguments which have won in the past and explains which arguments to use depending on your given situation. The first guide is priced at the level of a cup of coffee. The money received from this book helps The Prankster with fees such as transcript costs, travel costs to help out at court hearings and other associated costs. The second guide is free. 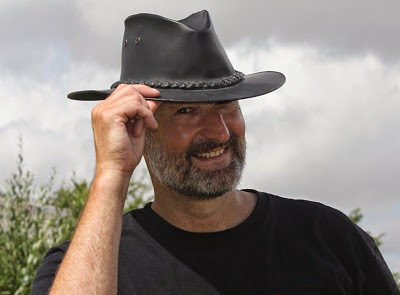 Both guides are available from The Prankster's website in various e-book formats. The Prankster hopes that anyone faced with a ParkingEye court claim finds the guides a wise investment for the price of a cup of coffee. What about a facility simply for on line donations to 'the cause' please? I wonder if Rachel has raided the petty cash tin for a copy of this ebook yet? If so, it will no doubt appear as an item on future N1 claim forms, along with that mythical £50 "solicitors fee" which they try to sting people for, despite her being a full-time salaried employee. Rachel will blow a gasket when she sees this.